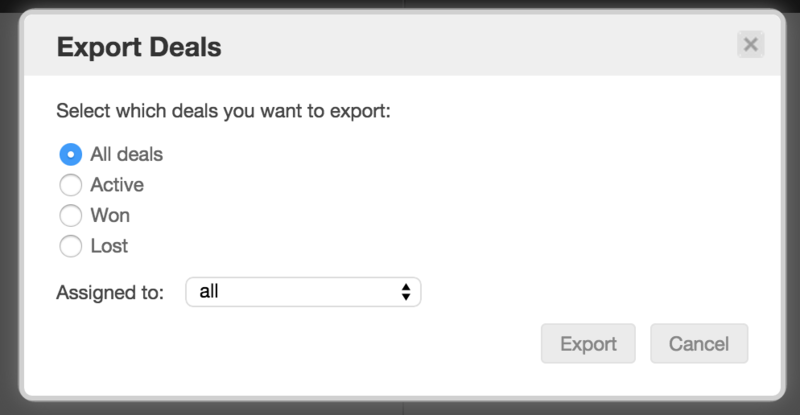 In Nimble, you can export your contacts, activities and deals to a CSV file that is delivered to your Inbox. An activity export includes Tasks, Logged Calls, Events and Custom Activity Types. 2. Check off the Select All box at the top. If you have more than 30 contacts, make sure you select ALL of the contacts. Note: The "Select ALL ###" option is available for People, Company, Recently Added filters, saved segments and tags. 3. Select specified deal information. 4. Confirm, and you will receive the export via email. Please note: Contacts and deals exports can only contain data that can be changed in the "Edit" page of a contact or deal record. While this does include any custom field data in your contact records (we are not currently able to support custom fields for deals), we are not able to export notes or email correspondence at this time.